This document frames the procedures established by Adel for community projects. We discuss the guidelines for proposal submissions, reviews and approvals, as well as management and operational oversight. We also outline fund allocation to approved projects and reward distribution to stakeholders. Executive Summary ▲ Presentation that summarizes the project for the Project Review Committee (e.g. PowerPoint, Prezi, or other canvas). Invention Overview ▲ Product, solution, or service. Marketing Strategy ▲ Strategic, tactical and operational goals, market landscape overview, competitive analysis, and unique selling proposition (USP). Sales Strategy ▲ Strategic, tactical and operational goals, monetization possibilities, channels to market, regional focus, and vertical or horizontal market focus. Capital Costs ▲ Research and development, production, and launch costs for the first three years of operation. Operational Costs ▲ Staffing, expertise, operations and management, and a draft organization chart. In order to stimulate new proposals, the Project Review Committee will manage an idea incubator where all members of the community can enhance their business plans. The R&D team will also be a source of ideas as a service to the community. 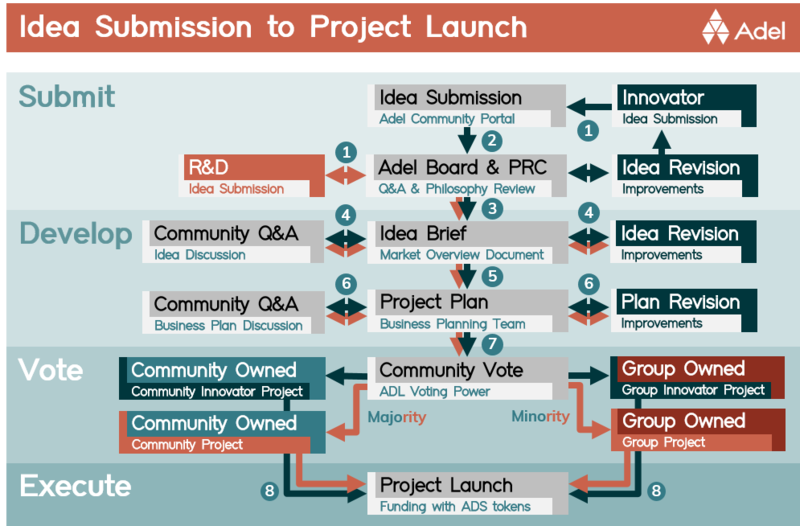 If a project idea comes from an individual member of the community, and if the inventor would like their idea to be public, then the project will be treated as if it had been submitted by the Adel R&D team (Figure 1). However, if they wish to maintain ownership of their idea, then it will become an Innovator Project. All the documentation stated above is still required for Innovator Project submissions. Once a project is successful and reaches its targets, or if the project is sold, then the distribution of funds will be divided among shareholders according to the proportion of their Adelshare (ADS) purchases. These rewards may be distributed back to stakeholders in ADL. The Project Review Committee will monitor a project’s progress and success metrics. This will include the management of individual project managers who will report to the committee on a weekly or bi-weekly basis. The Project Review Committee reports to the Adel Board on project progress, and community participation will occur on a monthly or bi-monthly basis. The community will see a summary of these activities in the Project Module. Ethical, moral, and legal standards will be monitored throughout the operation of projects. Violation of the Adel Code of Conduct will be addressed by a committee consisting of staff, Board members and legal experts. If a project is ongoing and successful, then rewards are distributed to holders of Adelshare (ADS) in a particular project. Final approval for every project is based on a community voting result. Members decide if the project will be funded from community funds or passed on to individual funding and become a Group Project. The Board serves as a curator of the community in order to remove unacceptable activities due to legal concerns, impracticality, or if the project violates Adel’s philosophy. Part of the approval process is the Project Review Committee’s review of all relevant documentation necessary for approval. Cost analysis will be reviewed to determine whether there are sufficient funds necessary for the initial project’s capital, as well as ongoing costs for the first three years of operation. Business plans that are voted on and approved by the community will include acceptance of the business plan, including all costs involved. Funds released for each project will be approved by the Adel Board. Human Resources ▲ With regards to the appointments of responsibility, the security of community funds prevails. Therefore, the members of each project will be identified according to Adel’s Anti-Money Laundering (AML) procedures. Mentoring ▲ Mentoring for each project and its management will be provided by the Board and the project management team in order to maximize the return on capital utilized. Participation ▲ Members will participate in the entire Idea to Project Supply Chain. They can present ideas, help improve on the market viability of the idea, help create the business plan, and solicit their expertise in the employment of a project. Motivation ▲ Motivation for members of the project team will be in the form of rewards and salaries. Some members will also be stakeholders in the project, so this is added motivation to ensure their contribution is successful in the form of project rewards paid to the member in Adelphoi (ADL). Employment ▲ The project team will be selected from knowledgeable experts within the community who have demonstrated expertise in the project’s respective area(s). If expertise cannot be sourced within the community, then the role will be filled by an external candidate. Project Management ▲ Management of the overall project portfolio will be monitored by a Project Manager who will report to the Project Review Committee. Gabriel is a seasoned sales and marketing expert with over twenty years of experience in senior level positions at companies such as Motorola, VeriSign (part of Symantec), and SecureWorks (part of Dell). His strengths lie in international business development and strategic partnerships, as well as the unique ability to translate complex ideas and technologies into language that decision makers can easily understand. Gabriel has a Bachelor’s degree in Engineering Physics from McMaster University in Canada and possesses expert knowledge in cloud computing, IT security, and video streaming technologies (Over the Top Content, OTT). Gabriel also runs his own company, Euro Tech Startups s.r.o., and manages two blogs: https://dusil.com/ and https://gabrieldusil.com/. Michal is an entrepreneur with international experience specializing in global business development and project management. He graduated from Indiana University’s Kelley School of Business with a degree in Finance and International Business and worked in various capacities in New York, Zurich and Prague. Michal is an active cryptocurrency entrepreneur with an extensive background in Forex algorithmic trading strategies and is always seeking new opportunities that maximize blockchain technologies. In this white paper, we discuss the phased rollout of Adel’s ecosystem. The first phase includes the launch of Adel through an initial coin offering (ICO). Phases two and three will focus on building and managing the community. This paper provides an overview of Adel and its ecosystem. We outline how the community can interact with Adel’s staff, as well as activities surrounding project submission, approvals, and operations. Adel is a community where every member is connected through token participation and voting. This paper outlines the roles and responsibilities of community participants, including its members, project managers and Adel’s leadership. This white paper outlines Adel’s advantages from three vantage points: its underlying blockchain technology, the Nxt and Ardor platforms from which Adel is built, and the additional business processes Adel has introduced to provide effective, community-based funding. In this paper, we discuss existing cryptocurrency technologies that are available today by providing an overview of the blockchain marketplace and Adel’s position within it. This white paper outlines the principles of a community-based ecosystem and how this can be sustainable and profitable using cryptocurrencies as its foundation. Spontaneity and creativity is impeded by a heavily formalized process which has been established by sizeable institutions that have evolved over many decades of operation. We outline how Adel will change the investment landscape and inspire technological innovation. In this paper, we outline established procedures to mitigate risk to Adel’s ecosystem while protecting its brand, infrastructure, and the integrity of blockchain solutions. In our continued efforts to communication Adel’s vision, this white paper expands our three-phase roadmap explained in White Paper #1, “Building a Decentralized Ecosystem”. We have now included our timescales to list ADL on exchanges, the introduction of our Adelshare (ADS), move to Ardor, and project execution (phase 3). Unauthorized use and/or duplication of this material without express and written permission from this site’s author is strictly prohibited. Excerpts and links may be used, provided that full and clear credit is given to Gabriel Dusil and dusil.com with appropriate and specific direction to the original content.